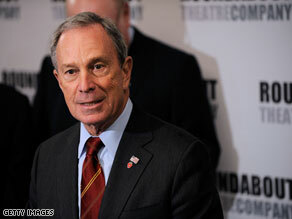 Bloomberg won re-election last November. (CNN) - Charles Montgomery Burns, better known as Mr. Burns in the hit animated TV series "The Simpsons", got the most votes of any write-in candidate during last month's mayoral election in New York City. According to records released by the New York City Board of Elections, the cartoon billionaire received 27 write-in votes out of the 299 that were cast. Burns wasn't the only fictional character to get votes in the race. Mad Magazine icon Alfred E. Newman, Fantastic Four arch-villain Victor Von Doom, Mickey Mouse, and Sleeping Beauty also received write-in votes. Many New York City and state political figures also got votes, including former New York City mayors Ed Koch, Rudy Giuliani, and David Dinkins. Others include Bill and Hillary Clinton, former New York governor George Pataki, Rep. Anthony Weiner, and the candidates from this year's congressional race in New York's 23rd district Dede Scozzafava and Doug Hoffman. Three historical figures also got votes: former presidents Abraham Lincoln and Teddy Roosevelt, and Nazi dictator Adolf Hitler. Other noteworthy figures getting a nod were New York Yankees shortstop Derek Jeter, radio shock jock Howard Stern, deceased comedian Rodney Dangerfield, and Robert Burke, better known to many New Yorkers as "the Naked Cowboy." Burns and the rest of the write-in candidates ultimately lost to real-life billionaire and incumbent mayor Michael Bloomberg. So billionaires got both the majority vote and the majority write in vote. They both invested similar percentage of their money in the process (hundreds of millions Bloomberg and 0 Mr. Burns) and got similar results. New Yorkers are really predictable!! !